Purchasing a house may be the single most significant investment you make. Whatever your dream home looks like to you – whether a newly built estate or a home with a story to tell – home inspections are a crucial part of the home buying process. A home inspection is a worthwhile expenditure that provides much-needed peace of mind; it can help protect you from dealing with the nightmare of a money pit. The American Society of Home Inspectors (ASHI) defines a home inspection as “an objective visual examination of the physical structure and [critical internal] systems of a house, from the roof to the foundation.” A home inspection is independent of a home appraisal. The latter is required for financing in all 50 states, but unlike a home inspection, an appraisal will not give you a BIG picture of the home’s overall condition. A qualified home inspector’s job is to thoroughly evaluate the home’s electrical, plumbing, and heating/cooling equipment; walls, ceilings, floors, windows, and doors; roof, attic, and insulation; as well as the foundation, basement (if applicable), and all structural components. An additional fee may apply for homes 30 years or older, pools and spas, and detached property structures. This varies depending on the home type. Inspecting a 2,000-square foot home generally takes about two to three hours. Once complete, the inspector will go over their findings with you, detailing any concerns they may have. Armed with this information, you can then negotiate with the seller to pay for or complete needed repairs. You may also have the option to withdraw your offer. It is always advisable to reinspect the home following any repairs. Foregoing a home inspection is not a good idea. There is nothing more important! Home inspections should be completed regardless of the home’s age – even new builds have hidden flaws. It is the inspector’s job to find those flaws, so you are not surprised with an extensive, costly repair bill in the future. While the cost of inspection varies depending on property type and square footage, from $250 and up, it is a small price to pay for peace of mind. Buyers are welcome to attend all home inspections. This opportunity allows you to familiarize yourself with parts of the property you may not ordinarily notice until weeks, months even, after move-in. It also lets the inspector visually present their findings. The inspector can point out any “major” flaws as well as identify any maintenance concerns. You should feel free to ask questions throughout the process. As mentioned, while you should always be present at a home inspection, you shouldn’t try to do the inspector’s job. Doing so may result in inaccuracy. For example, turning on a faucet while the inspector is checking the water pressure in another area of the house can cause the inspector to note “low water pressure,” which may prove incorrect. Always let the inspector do his/her job. King Home Inspections guarantees thorough home inspections, every time. Our inspectors, who have extensive construction experience, only complete two inspections per day. This ensures 100% of our attention is given to you and your home. Computer generated reports are always provided the same day of the inspection. 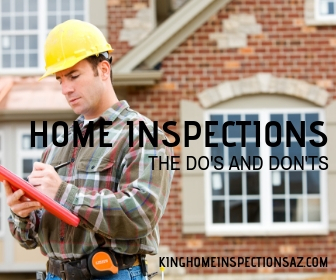 Request an appointment for home inspection today at (602) 550-1913.